Every January, millions of people make New Year's resolutions to lose weight, eat healthier and start exercising regularly. Of those millions, only about 5 to 10 percent of them will actually follow through and lose weight, choose healthier foods and still be exercising three months later. Even fewer will be successful six months later. While there is much information and research showing the most successful ways to lose weight and keep it off, most of us want to have immediate success and will latch on to anything that promises weight loss in a short amount of time. There is no pill or special diet that will melt the fat away. Most people don't realize it's a lifelong commitment that takes time to achieve, and it's hard work and regular exercise that get the job done. Sorry to be a downer, but that's the truth. The best method of getting to and maintaining a healthy weight is prevention - don't gain weight. That is difficult in our society, which promotes convenience and fast foods, empty calories and calorie-dense drinks. After teaching weight loss and healthy eating classes for 20 years, I have seen what works for many people - using tools to lose weight and keep it off. Another important piece of the weight-loss puzzle is your readiness. Many people start diets and healthy-lifestyle programs only to revert to their previous habits and behaviors. That's OK. Sometimes it takes a few attempts to get something right, just like practicing a sport or musical instrument. The healthy behaviors you would like to adhere to may take time to develop and become habitual, so don't be hard on yourself if you slip up or get off track for a while. Just get back on the healthy-lifestyle habits again. This time may be the right time for you to lose the weight and keep it off. Here are my suggestions, which are evidence-based and used in many successful weight-loss programs. 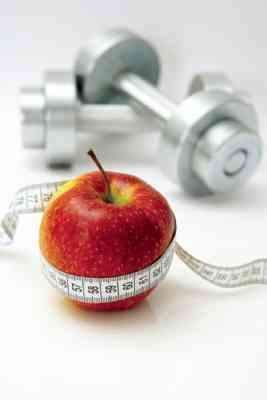 These are valuable tools you can use throughout your life to maintain a healthy adult weight. •Keep a food journal. Write down everything you eat during the day and count the calories. According to the National Weight Loss Registry, this is the most useful tool for people who have lost at least 30 pounds and kept if off for more than a year. There are many helpful books about calorie counting and journals you can use for this purpose. I know this journal is the most tedious and difficult of the weight-loss tools, but it will make you an informed eater who is aware of food behaviors and daily calories. A journal may help you understand your food issues. •Buy and wear a pedometer. Don't get a cheap $5 model: You can spend $15 to $30 on a decent pedometer that will track your steps, distance and calories burned. This is an important tool to use with your food journal to compare calories in vs. calories expended. Remember, that is all that matters in weight loss: Put into your body less than you expend in calories. That is why exercise is integral for permanent weight loss and maintenance. Exercise regularly (60 to 90 minutes per day) for weight loss. It doesn't have to be consecutive; it can be 3- to 20-minute bouts, 4- to 15-minute bouts, etc. •Eat more plant foods and less animal foods. Plant foods contain many vitamins, minerals, phytochemicals, fiber, protein, no saturated fat and very little fat in general. Plant foods increase our nutrient density (how many nutrients vs. the amount of calories per serving), and not calorie density (lots of calories with relatively few nutrients) from the foods we eat. •Watch portion size. This is a very important part of maintaining a healthy weight, because most of us eat in restaurants on a regular basis. Restaurants and super-sizing have given us "portion distortion" - our idea of what a portion size is has increased over the last 25 years. There are many great resources on portion sizing online and in books. •Drink mostly water. Cut out calorie-containing beverages. Yes, this means alcohol and lattes (sorry). The recommendation from most nutritionists for people trying to lose weight is to give up alcohol (lots of empty calories) and most calorie-containing beverages, including juice and coffee drinks. You can add them back in gradually once you've achieved your weight- loss goal (or not, if you've found you don't need them in your new healthy diet). •Find a partner. A friend can help you with your weight-loss goal. This is also shown to be a very important and powerful tool to aid in weight loss. National Weight Loss Registry statistics show that many weight-loss programs are based on group-support models. Make sure your friend is someone who has similar goals and will not distract you or get off track when the going gets tough. Your spouse may not be ideal: Men lose weight faster than women because of greater lean body mass, so it may be demoralizing to diet with your husband. Wives beware! b Create a healthy-lifestyle environment. Surround yourself with foods, recipes, friends and reading materials that support your goals. Why have chips at home if you don't want to eat them? A woman in one of my weight-loss classes years ago said she had to have junk food at her house because of her teenage boys, and the temptation was difficult for her. I thought, why would you want to feed your children that junk food and teach them bad behaviors that they will one day have to (or should) break? We have a 16- year-old in our house, and he eats the way our family eats - healthy, with a small amount of discretionary foods he can choose (natural soda, organic chips, cookies). Children need to learn how to eat healthy. Even if they are thin or normal weight doesn't mean they should be allowed calorie-dense foods and low-nutrient foods. They are growing, and need healthy foods to fuel their growth and energy demands. Plus, I know my son goes to friends' houses, the store and the movies and gets plenty of the less-healthy foods. •Learn how to cook healthy foods. Buy yourself a cookbook that focuses on healthy ways of preparing meals, including many ethnic cultures such as Italian, Asian, Indian, Mexican, Spanish, Mediterranean, etc. This will expand your horizons on what healthy foods can taste like. Happy New Year to you, and may this be the year you reach your healthy weight, if you're not already there. Jeanine Justice has 20 years of experience in nutrition. She is currently the coordinator for Healthy Lifestyle La Plata Coalition. Reach her at jjustice@sucap.org.